I've been riding since I was very young. I was born into an equestrian family: my mother, Christine, is an Olympic dressage rider, and my father, Bernie, is best known for his accomplishments as a Grand Prix show jumper - but was also very successful in dressage and eventing. I was taught primarily by both of my parents, until I turned professional at the age of 18 and began working for and studying under other great riders, like Simon Nizri, Mandy Porter, Michelle Parker, and recently acquired a lot of experience and accomplishments as part of Neil Jones Equestrian. I currently run my own business here in San Diego, California, and focus primarily on the training and development of young horses. I absolutely love producing young horses and find it not only an important facet of the sport to emphasize, but it is very fulfilling to grow with a horse through its career. Find me on instagram or on facebook. I absolutely LOVE Mastermind breeches. I swear by them as being the most comfortable, well-fitting breeches you can find. They are detailed with elegance, and I love their color options available. I also find them to be the most durable out of any other breeches - considering I ride around 8 horses every day and work in the barn. For the show ring, I prefer my Secchiari boots. I purchased my first custom pair at Solea Equestrian, designed all black with a bit of patent piping at the top. I'm very simple and traditional when it comes to my show boots, and find Secchiari to be my favorite because I can create an elegant boot that is tough enough to handle the amount of ring time I have, yet keeping a stylish and classy look. Side note: under my boots, I always have Foothuggies riding socks on. Jeffi at Foothuggies makes the best socks for riding. Soft, comfortable, no-tear or holes, and sweat-proof! You can also design your own pair with your logo, name, or horses. They're fun! I've tried so many helmets - really, SO many - and have to say that my all-time favorite helmet is the Samshield Miss Shield. It's classic, so comfortable, and offers a wide rim to protect your face from excess sun exposure. They also offer this helmet with rose gold piping, and it is gorgeous! My CWD 2g Mademoiselle is by far the best saddle I have ridden in. It fits every horse I put it on. Detailed but a classic look. And, most importantly, I feel close to the horse. I find too many saddles these days are so over-produced with padding and elements that take your leg and connection away from the horses. I don't find that the case with my Mademoiselle and feel truly connected to my horse and able to apply my seat and leg correctly and effectively. We are thrilled to welcome our new social media maven, Lexi Karet, to Mastermind. Lexi's exuberance and enthusiasm are a reminder of the promising future generations of upcoming equestrian athletes. Lexi is currently pursuing her undergraduate degree in English Literature with a minor in Apparel and Merchandising at Colorado State University. As a member of CHJA and USEF, Lexi has competed as a hunter/jumper since she was 12 years old. She has two horses: Peter, and her young prospect, Prada. This summer Lexi took a hiatus from showing in order to focus on training Prada in preparation to compete in the upcoming hunter ring next summer. In addition to riding, Lexi enjoys yoga, running, and spending time with her two fluffy dogs: Benson and Bauer. Calleen Kinney is an adult amateur competitor who comes from a long lineage of professional and amateur equestrians. Calleen’s parents both served in the Marines and, at an early age, fostered her appreciation for and interest in riding and competing. At only nine years old, she was introduced to her first horse; which spurred her lifelong passion for equestrianism. Calleen attended the University of Florida and earned her B.S. in Animal Science– specializing in Equine Science. Upon graduation, she continued her family’s military tradition and became a pilot in the Marine Corps (she has since earned the rank of Major). In addition to pursuing her riding and military career, Calleen is a proud wife and recent mother of an 11 month-old baby girl. Calleen and her family are currently stationed in Virginia; where she divides her time between her family, military career, and her 7 year-old Westphalian gelding, Sokrates (a.k.a. “Duke”). 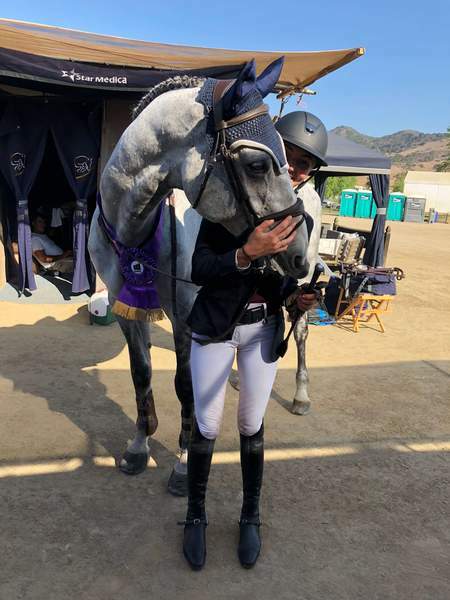 She has acquired her Bronze medal and currently rides and trains with her Aunt, Jackie Kinney, who runs and owns Horses in Harmony Dressage Farm in Maryland. Her next goal is to achieve her Silver medal by the time she retires from the Marine Corps.